There was a time when the ceiling fan was only of one type. The standard ceiling fan that we still use today. But the technology in this field is also advancing at a very rapid pace, same as every other field. When the ceiling fans were first introduced they came with only two blades. The modern day fans have blades ranging from 3 till 8. The way houses were built in the past has also changed dramatically. The houses used to be quite big with big rooms and tall ceilings. In today’s world there a lot of houses that are very small with small rooms and very low ceilings. The low ceilings gave rise to another problem and that is the installation of the appropriate fan. The standard fan cannot be installed in the room with low ceilings because of the clearance issue. The fan companies now have to come up with the solution to this problem. The solution they came up with is the hugger ceiling fan. 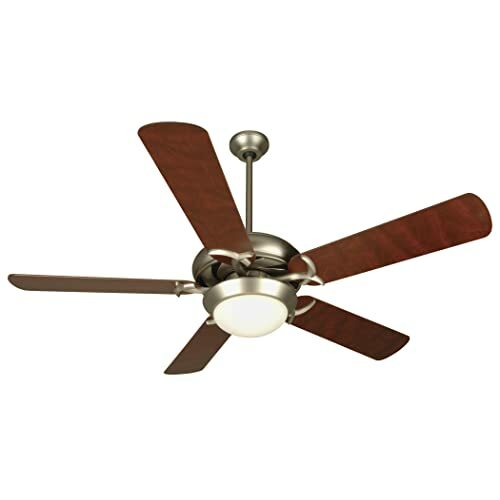 The standard ceiling fan has a downward facing rod with one attached with the mounting plate and the other with the fan motor. The downward rod makes the fan quite far from the ceilings and this can cause clearance issue in a room that has a ceiling less than 8 feet high. The hugger ceiling fans is the best fit to the rooms that have a low ceiling. Since the hugger ceiling fans do not have a downward rod, therefore they fit perfectly in a low ceiling room. The hugger ceiling fans are so close to the ceiling that they almost hug it. This is the reason why these fans are called the hugger ceiling fans. There are a lot of different types of hugger fans available in the market. There is a lot to choose from when it comes to these hugger ceiling fans. These fans are usually used where the height of the ceiling is less than 8 feet. But this is not the only use of the huggers. Since these fans are very compact, therefore they look very attractive to the eye. If someone is looking to give their room an improved look they can also go for the huggers. One of the most famous huggers is the Minka Aire. These fans compliment a great deal in contemporary décor. 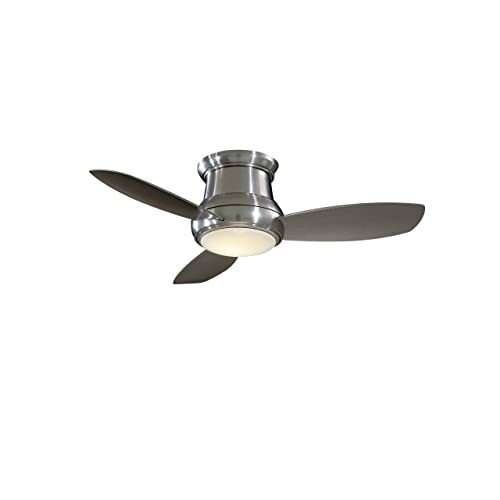 These fans hang 10 inches below the ceiling even if you have a lighting fixture installed. The blades of this fan are concave with white finish. Another attractive factor of this model is that it has a hand held remote. This fan comes in with a warranty of a lifetime. Therefore all in all, this fan is the one you can choose if you have a room with a contemporary décor. 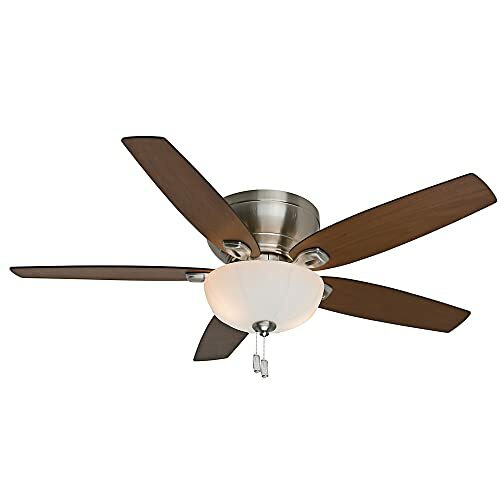 Another well renowned model of the hugger ceiling fan is the Monte Carlo. These fans are quite as similar as the Minka Aire and designer fans as well. The Monte Carlo hangs 9 inches below the ceiling, and this might be the only difference between the Monte Carlo and the Minka Aire. The warranty of these fans is also a lifetime same as that of the Minka Aire. It is another company that produces some quality hugger or low profile fans. Craftmade has a complete range to choose from when it comes to these low profile ceiling fans. This company produces huggers with a lot of different styles and there are also many blade options to match your requirement. The guarantee of these fans is not that of a lifetime but 30 years unlike the Minka Aire. These fans come in the lighting kits and different glass to choose from. It can be rightly said about these fans that they can be a perfect fit for your home when it comes to hugger fans. Since these fans have a wide variety to choose from, so you can get a fan that perfectly matches your needs and requirements. 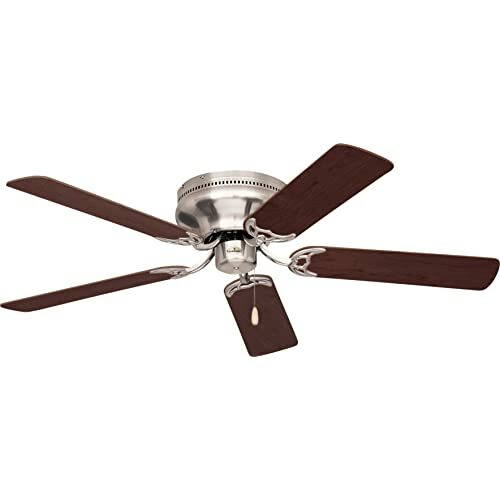 Another option that you have while choosing a low profile ceiling fan for your room is the Casablanca. This fan is famous for its classic style. The blades of the Casablanca have an antique look with oak matt finish on them. These fans have a brass finish as well. When it comes to the control options it has the same classic pull chain control. So if you have a room with a low ceiling and you want to give it a classic look, the Casablanca is the perfect option for you. You can improve the look of your room by having this classic fan installed in it. All these low profile ceiling fans contribute in enhancing the outlook of a room that has low ceilings. You have a wide range to choose from when it comes to these low profile ceiling fans. Therefore you can choose the one that you think will be the perfect for your room and will give it an improved look. Even if you have a room with a tall ceiling and you want to give it an improved look the low profile ceiling fans can help you a great deal in doing so. All your worries are over if you have a low ceiling room and you want to have a ceiling fan installed in it. Hugger ceiling fans is the right answer for you. Since this fan has no rod therefore it eliminates all the clearing issues that you can have with the standard ceiling fan. Now you can have a low ceiling room with a ceiling fan installed in it as well, thanks to the huggers for eliminating this issue. The huggers not only eliminate the issue of the clearance but also contribute heavily in giving your room a new and improved look. Since the market is flooded with these huggers, there is a lot that you can choose from according to your liking and requirements. So now you can have a ceiling fan in your low ceiling rooms that can also compliment the décor of it. Can a Ceiling Fan Fall and Hurt Me?